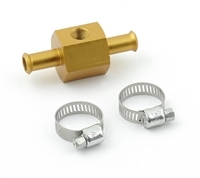 The fuel pressure gauge adapter is an easy way to add a fuel pressure gauge. Fits Holley 4150 Dual Feed Carburetors with 9-3/8" center to center fuel inlets. Fits Holley 4160 Dual Feed Carburetors with 8-5/8" center to center fuel inlets. Fits Holley 4500 Dual Feed Dominator Carburetors with 11-1/2" center to center fuel inlets.